Part One - God TV's "Apocalypse & The End Times," is an example of how New World Order conspiracy theories are being marketed to millions as end times prophecy. The danger of New World Order narratives is not the criticism of government and institutions like the Federal Reserve, but the use of grand conspiracy ideology in their attacks. In this context "grand" refers to conspiracies which claim that a secretive, centuries-old and centralized cabal of "Illuminati" continuously manipulates the world. The prophecy/conspiracy genre cloaks this in millennial terminology, claiming that the Illuminati's assault on "true" Christianity is paving the way for the one-world government of the Antichrist. As in narratives of the past, Jews, Jesuits, and Freemasons are again being scapegoated as the source of the claimed Illuminati cabal. In 2004, Michael Barkun stated,"Prior to the early 1990s, New World Order conspiracism was limited to two subcultures, primarily the militantly anti-government right, and secondarily Christian fundamentalists concerned with end-time emergence of the Antichrist." Since the early 1990s tales of the New World Order have been continuously marketed to millions of Americans through end times prophecy media. Have you heard about the concentration camps for imprisoning Christian patriots? Or the global elites who are planning to reduce the population of the world by a third while they have new body parts for themselves developed in underground laboratories? Know about the demonic cabal behind the Federal Reserve and their plan to intentionally destroy the U.S. dollar? While the references to Jews, Jesuits, Freemasons, and others are often more subtle, the usual targets are again described as being behind these conspiracies. Some of the worst paranoid conspiracy theories seen in generations are being marketed as end times prophecy. Over the last few years, writers at Talk2action have written repeatedly about this reemergence of 1920s and 1930s type conspiracy theories, tracking the growth of the prophecy/conspiracy genre since the early 1990s. In the video (clip below) Ammerman explains that eight families pull the strings through their control of central banks around the world. 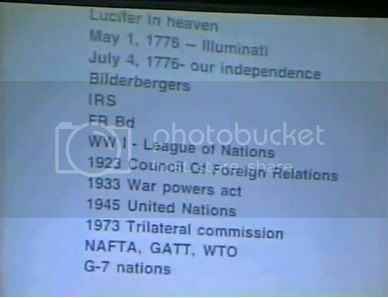 "But here are the major stockholders of the Federal Reserve. They own the Federal Reserve. The Rothschilds with offices in London and Berlin, the Lazard brothers in Paris, Israel Seif of Italy, Kuhn Loeb Company of Germany, the Warburgs with offices in Hamburg and Amsterdam in the Netherlands and the last three are all interlocked - Lehman Brothers of New York, Goldman Sachs of New York, and Rockefeller of New York." Ammerman, the speaker in video above, heads the Chaplaincy of Full Gospel Churches, the endorsing agency for over 270 U.S. military chaplains and chaplain candidates and 180 civilian chaplains. He is also Vice President of the National Council on Bible Curriculum in Public Schools and an apostle in the International Coalition of Apostles (ICA). During the 1990s, there was an explosion of the prophecy/conspiracy genre through fiction series like Tim LaHaye and Jerry Jenkins' Left Behind series and accompanying study aids, videos, and games. Televangelists like John Hagee also camouflage these conspiracy theories as end times prophecy narratives. Hagee is well known for his "pro-Israel" activism including founding Christians United for Israel (CUFI). Some Jewish leaders have embraced these Christian Zionists despite the fact that these New World Order conspiracy theories are based on narratives that are historically anti-Semitic. Hagee describes the coming New World Order as the "Fourth Reich" which will be ruled by a gay, partially Jewish Antichrist. Hagee also claims this Antichrist will emerge from the European Union and possibly be a Nobel Peace Prize winner. "participate in dressing the land for the return of Jesus." See Richard Silverstein's article at Tikkun Olam, Isaiah Weeps: Jewish National Fund, God TV Erase Israeli Bedouin Village to Bring Second Coming. God TV was founded in the U.K. in 1995 by Rory and Wendy Alec, a couple from South Africa. The network is broadcast in North America, Africa, Asia, Europe and Australia, claiming a "divine mandate to win one billion souls." Many Religious Right events are now broadcast on God TV including: Lou Engle's The Call, an "Election Special" in 2008 which featured James Dobson, Tony Perkins, Pat Robertson, and John Hagee, along with Apostles Cindy Jacobs and Lou Engle, the May Day Prayer Rally, and more. Right Wing Watch has done an excellent job following these broadcasts, but unfortunately the video posted has been removed from YouTube at the request of God TV. God TV network regularly features Dispensational evangelists and authors like John Hagee and Tim LaHaye who teach that believers will be Raptured or snatched from the earth before the horrors of the end times. However, God TV is the network of choice for the "apostles and prophets" who have rejected the pre-Tribulation Rapture of Dispensationalism and are training youth to be "end times warriors" with a mandate to purge the earth of evil themselves in preparation for Jesus' return. This is not Dispensationalism, but a more aggressive end times theology that is sweeping the Independent Charismatic sector of Christianity. Leaders have maintained the urgency of premillennial Dispensationalism, but altered the narrative to include a powerful and victorious church in the end times. The end of the age will still feature the cataclysmic events of Revelation and the reign of the Antichrist, but believers, who remain on earth during the Tribulation, will emerge victorious. This end times prophecy narrative which is rapidly gaining popularity requires that believers prepare themselves to be a part of the end times drama. While there has been little attention paid to the possibility, I would argue that not only the popularization and mainstreaming of end times prophecy, but this shift in theology is fueling much of the Antichrist hysteria that can be seen in political dialogue. Questions about whether President Obama is the Antichrist have been addressed on network news stations. The now widespread narrative claiming believers will not escape the events of the Tribulation, but will be end times warriors, is feeding both fears and excitement that these events are imminent. New Apostolic leaders like Mike Bickle, founder of the International House of Prayer (IHOP), and Lou Engle, founder of The Call (and now also based at IHOP), are teaching youth that they must prepare to fight, even to be martyrs, in order to bring about a utopian "Kingdom" on earth. Both are regulars on God TV, including Bickle's appearance on the series "Apocalypse & the End Times." See the beginning of Part Three of the Bickle segment to understand why he is so anxious to help bring about "the end of the age." With the help of Youth With A Mission (YWAM), Bickle has taken his IHOP concept international and now youth all over the world are preparing for the end times. As Bickle stated in the December 7, 2010 issue of Charisma magazine, he personally believes that the end times will be seen by a generation already born. McGuire claims that global elites are planning to reduce the population of the world by one third and that underground laboratories are creating replacement body parts to keep these elites alive indefinitely. Jack Hayford is an international Christian Zionist leader who partners with Israeli and Jewish leaders despite the fact that his seminary has a division dedicated to training Messianic Jews for the "redemption of all Israel." CUFI director Robert Stearns, also co-founder of the Day of Prayer for the Peace of Jerusalem (with Jack Hayford) was mentored at IHOP by Bickle and teaches at the Israel Mandate conference. Lou Engle, who heads the anti-abortion, anti-gay "The Call" is also based at IHOP Kansas City with Bickle. God TV is incorporated as a nonprofit in the U.S. under the name Angel Christian Television Trust, and has regional offices in the U.S. including a base in Grandview, Missouri, near Mike Bickle's International House of Prayer (IHOP) headquarters (outside Kansas City, MO). The Alecs bought a historic estate in that area in 2009. Just once some Christmas, I would like to see a real angel show up on the tree just as I plug in the light - bam! - nuclear glory radiating, frying the Christmas tree into a skeleton of smoldering sticks; everyone in the family slain spiritually, unable to move for hours under the weight of the angelic presence. A true "touched by an angel" episode and a Christmas to remember. If I were in dreaded conflict with an evil principality or power and I called the Lord for help, and a Gerber baby showed up, I would not feel much comfort. I do not care if the baby measured fifty feet tall - if he were wearing a diaper, I would not feel reassured. I want a real angel to show up, massive, terrifying, sword drawn, fire zooming out its eyes and hands, and with six wings. Real angels do not wear diapers. They are warriors in the service of the Lord of Armies. They know how to fight. The New Apostolic world is filled with powerful angels and demonic principalities, battling over the earth in a cosmic drama and impacting the future of humanity. God TV co-founder Wendy Alec, a self-proclaimed prophet, paints a picture of this world in her book series Chronicle of Brothers. See Part Two of "The Prophecy/Conspiracy Genre: Using End Time Prophecy to Mainstream New World Order Conspiracy Ideology." That Ammerman fella should trim his moustache a little better--he'd look just like Hitler.